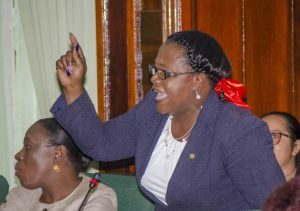 Even as Junior Minister of Natural Resources, Simona Broomes refused to say whether she would apologise to two security guards with whom she had a now almost one week old fracas, Vice Chairperson of the People’s National Congress Reform (PNCR), Volda Lawrence said she was taken aback by one of the personnel’s account of the incident. While Broomes was on her way to the Parliament Building’s Chamber, she was asked whether she would apologise to the guards at New Thriving Restaurant, Providence, East Bank Demerara. She responded, saying “I don’t know what you’re talking about”. When told that she was being questioned about the incident at the parking lot, she maintained that “I don’t know what you’re talking about”. Lawrence, for her part, said Broomes would have to make her own decision on whether to say sorry, but she apologised on behalf of herself and the PNCR. “We didn’t come into government for issues like this. We came into make changes,” Lawrence said, adding that she went to the restaurant to purchase food and one of the guards related his account of the incident. Joseph Harmon, for whom Broomes is campaigning to win the PNCR’s chairmanship, said the incident was still being investigated by the Guyana Police Force. He is coming up against incumbent, Basil Williams and Lawrence for the chairmanship which is the de facto deputy party leader. 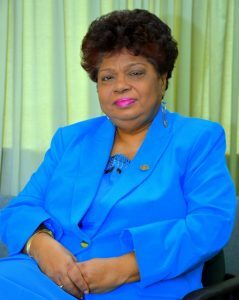 General Secretary of the PNCR, Amna Ally maintained that she did not have all of the facts or seen the surveillance video that disputes Broomes’ claim that one of the guards cocked his service shotgun and pointed the weapon at her. The video shows Broomes removing the traffic cones from an area that the guards had told her driver was a no parking area. Ally said “all and sundry must observe the rule of law whether you are a minister, you are an ordinary person; that is what is expected.” On whether Ally had seen the video recordings, she said “I have more important things to do”.